The quality and consistency of image grading are central to the effectiveness of diabetic eye screening. Annual screening of the back of the eye with digital photography helps prevent sight loss in people with diabetes by detecting diabetic retinopathy early when treatment is most effective. Only qualified and trained staff are allowed to grade these images without supervision. All national graders have to do the same grading qualification and monthly grading test (TAT). This is an internet-based resource available to local screening providers that helps staff improve their skills in detecting signs of disease on images. TAT has helped drive significant improvements in the quality and consistency of grading across England. Nearly 1,600 graders are currently registered on the system and nearly 90% of them have participated in it during the past year, which is great news. Each set of 20 cases is randomised, so no 2 graders see cases in the same order. After each month-end, graders can compare their answers with the results of their local and national peers. 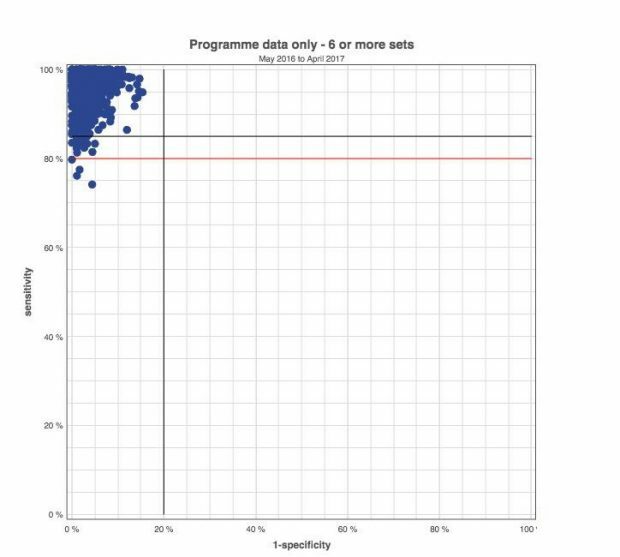 The latest TAT results data shows good national sensitivity and specificity rates for referable disease. This can be seen clearly in the scatter plot below. Each dot represents a grader. Dots above and to the left of the black lines represent graders with a sensitivity above 85% and a specificity above 80% and will have a green flag. The 4 dots below the red line represent graders with a sensitivity of 80% or below and will have a red flag. The scatter plot shows that national graders are really good at correctly identifying cases with referable disease and classifying others that do not need referral. It’s essential that local screening providers regularly check that TAT’s participants accurately reflect staff who are grading for their service. This will ensure reports are as accurate as possible for local and national teams. Trainee: A grader in training studying towards the Health Screener Diploma or the City and Guilds qualification who works for a local diabetic eye screening provider but is not grading unsupervised. 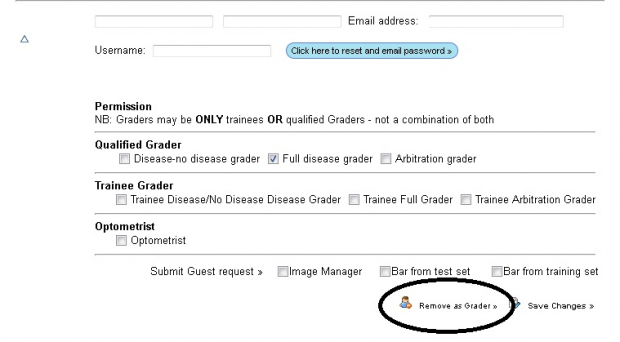 Full disease grader: A fully trained and qualified grader who works for a local provider and grades unsupervised. Guest: Someone who falls into neither of the above categories but requires access to the TAT system to grade. Log on to the system. Click on ‘Graders’. Click on the blue arrow next to the grader’s name to show all details. Then select ‘remove as Grader' (see screen shot below). The guidance for TAT participation is on GOV.UK. We are writing supplementary guidance to cover who can apply for guest registration and will notify local providers when this is complete. Local programmes are asked to complete this exercise by the end of October 2017. The screening quality assurance service (SQAS) receives the quarterly grading management reports and will follow up with local programmes to ensure lists are up to date. Thank you for your help.